Tim Engelhardt, DJ Koze, Danny Daze, La Fleur, Djuma Soundsystem and more. This show was 6th in the global berlin chart. 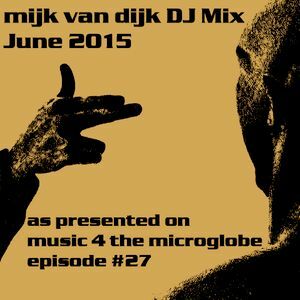 This is the DJ mix of music 4 the microglobe #27, the June 2015 episode as heard live on BLN.fm, cuebase-fm and XLTRAX on Thursday, June 18th 2015. With new tracks by Tim Engelhardt, DJ Koze, Danny Daze, La Fleur, Djuma Soundsystem, Patrick Chardronnet, Booka Shade, Yaruba, Ellen Allien, Laurent Garnier, Traumer, Voiski , Clemens Neufeld, Sasse, Oliver Lieb, Fur Coat, Stephan Bodzin, Gregor Tresher, Kölsch, Reqterdrumer and Frank Müller. Thank you. But I am in so many Facebook groups already and I want to concentrate on my production side at the moment.